Magician Terry Ward has performed for the most prestigious audiences including, fortune 500 companies such as Coke-a-cola, Nestle Carnation, GE, AT&T, and Walt Disney World. Using his dynamic personality, he brings the artistry of magic to a new dimension. By combining magic, comedy, and audience participation, Terry will keep your audiences laughing and well entertained throughout his performance. 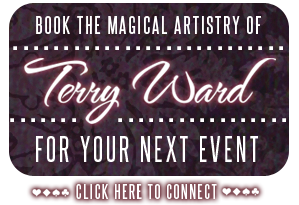 Terry Ward is a proven performer of many talents… magician, actor, master of ceremonies, man of many dialects, television actor and script writer, and consultant for television and theater productions. Where ever and whatever the event, you can expect terry will entertain you with the unexpected.